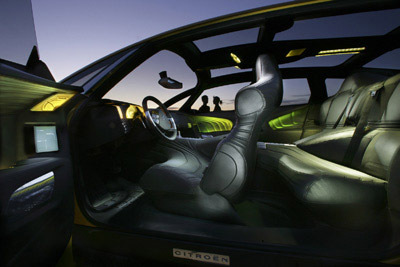 At the 2005 Frankfurt Motor Show, Citroën presented a new generation of the grand touring car, with the C-SportLounge concept car, a car which stands out with its bold, angular and distinctive body style. Aerodynamic exterior lines and an aircraft cockpit-inspired interior designed for the pleasure of the driver and the comfort of the three passengers. Citroen took special care regarding the air flow around the C-Sportlounge, resulting in a drag coefficient of just 0.26. The front end of the C-Sportlounge is complimented by the multiple air intakes and stretched headlamps running up in front of the mirrors. The expansive windscreen melds into the sunroof in an unbroken line, offering a broad glass surface, enhancing visibility and aesthetics. With suicide doors at the rear, the C-SportLounge offers offers maximum accessibility for its size. The steering wheel incorporates paddle shift controls for gear selection and the driver's seat and central console are attached, so that the automatic gearbox and climate controls are close at hand, irrespective of the driver's seat position. 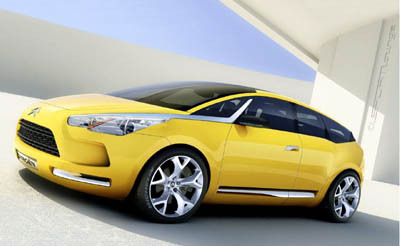 In 2011 Citroen revealed a production car called the Citroen DS5. 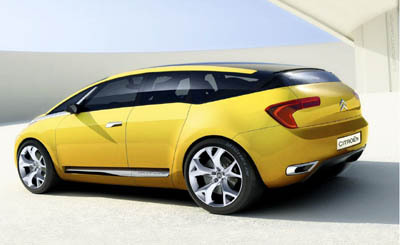 The styling of the DS5 was inspired by the design of the C-Sportlounge concept.